Austin, Texas is a city that appreciates a good mural. As an organization that appreciates an art-loving community, our Color Squad teen program combines the two — mural and community — to design and execute a brand-new piece of public art each year. This year’s mural, titled “Welcome to Austin,” focuses on the themes of community and home, and will be unveiled at Lott Pocket Park on Memorial Day, May 28. Check out the murals on your own time using this interactive map. We’re kicking things off with the very recognizable Til Death Do Us Part mural that sits at the corner of 7th and Waller streets. You’re likely very familiar with Federico Archuleta’s art, even if you don’t recognize his name. The graffiti artist and illustrator works with stencils to create his Mexican-inspired, bright, pop-y works that cover much of Austin. His tools of choice allow him to recreate a prolific number of colorful murals, including the piece featuring two loving skulls, giving them the ubiquity they’re known for. 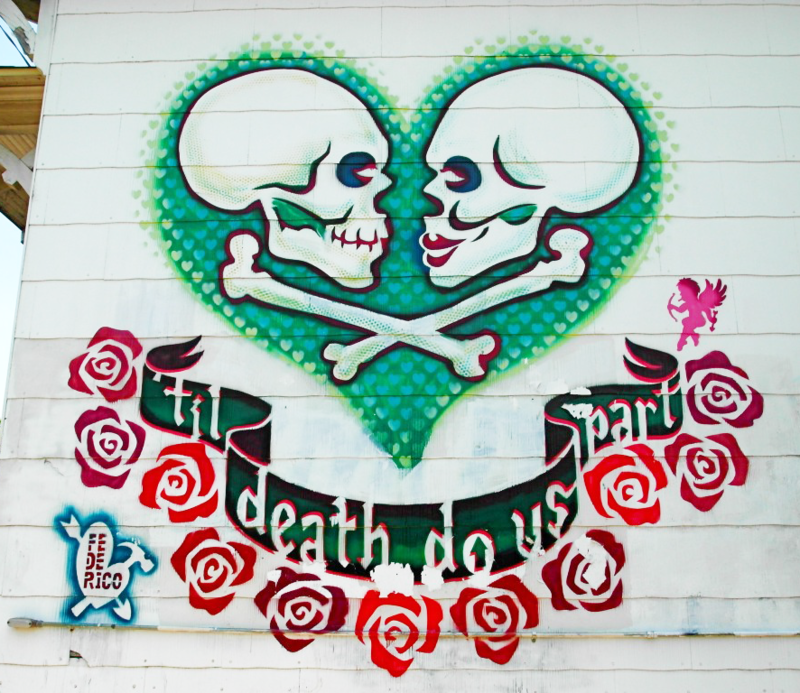 Til Death Do Us Part is iconic here in Austin, but it’s not Federico’s only recognizable piece. You probably also know and love his Selena portrait, the full-body Virgen de Guadalupe, and the Johnny Cash, Willie Nelson, and Bob Dylan figures that grace Manor, South Congress, and Guadalupe respectively. Federico’s colorful aesthetic is heavily influenced by the fusion of Latino and American cultures he grew up with on the border in El Paso, Texas. Map Your Roots, designed and created by Creative Action’s Color Squad group in 2015, tells the story of the Chestnut neighborhood where the Center for Creative Action resides, through the use of symbolism. After a thorough period of research and community engagement, Color Squad teens used what they had learned to design the large scale, color mural on the back of the center facing the Sustainable Food Center Garden. The foundation of the mural is three hands used to represent the three periods depicted in the work. The hands on the left cradle dirt (like that in the nearby garden), and stand in for the time before the 1960s when the neighborhood was largely agricultural. Directly below the farming hands, are goats that represent the Meyers goat farm, a part of the area’s agricultural history that sat where Flatbed Press and Austin’s Christopher House site currently. The farm, and a log cabin that was a part of it and is also depicted in the mural, were still in operation throughout the 1960s according to local lore. The next hand, located in the middle of the mural and balled into a fist, represents both the civil rights movement and neighborhood resistance to industrial environmental contamination in the 1970s and 1980s. At the time, the Chestnut neighborhood was home to the Featherlite cement factory which left a thin layer of cement dust on cars and clothesline directly across the street. That dust is symbolized the pink clouds at the top of the Map Your Roots mural with the factory itself painted just below. Three community activists — Ethel Fresch, Robert Humphries Jr., and Ida Manor — who helped remove the factory, and the pollution it brought, from the neighborhood also have a place on the mural to the left of the pink clouds. Next to the factory, in line with a tall building that represents the ongoing period of growth in Austin, is a mouth that represents the arrival of Creative Action in the community. The mouth symbolizes youth voice, which Creative Action engages to help address community concerns. And above the mouth and to the right of the tall building is the Metrorail train that the Chestnut Neighborhood Planning Team conceived of the improve the neighborhood’s access to public transportation. Finally, the final hand at the top, right hand side of the building throws an airplane toward the right, representing Creative Action’s hope for the area’s future, as well as the uncertainty of what lies ahead. Austin soul songstress Lavelle White, Victory Grill founder Johnny Holmes, and pianist Roosevelt “Grey Ghost” Williams have graced the side of legendary restaurant and music venue Victory Grill since the traveling Trust Your Struggle artist collective painted the mural on the side of the legendary cafe and music venue in 2008. Victory Grill — so named because it opened on the day Japan surrendered in World War II — was intended as a place where returning black soldiers, as well as locals, could enjoy the nightlife of segregated Austin. It quickly became a music venue go-to for popular, traveling acts, including James Brown, B.B. King, Chuck Berry, Etta James, Billie Holliday, Bobby Bland, Tina Turner, and Clarence “Gatemouth” Brown. 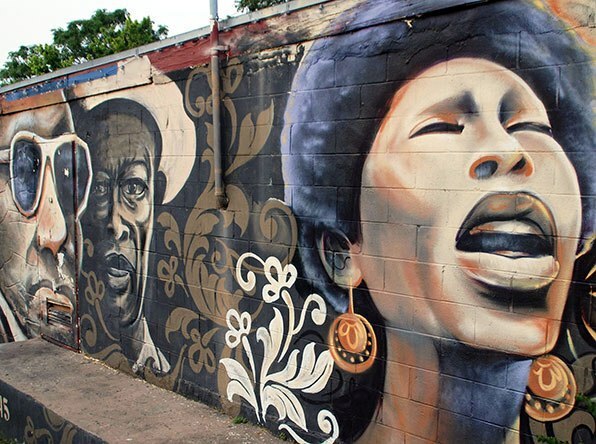 As one of the few remaining original nightclubs on the “Chitlin’ Circuit” of the 1950s, Victory Grill established Austin as a music destination, and cemented East Austin as a center for black culture in the city. The mural commemorates that musical and cultural history. 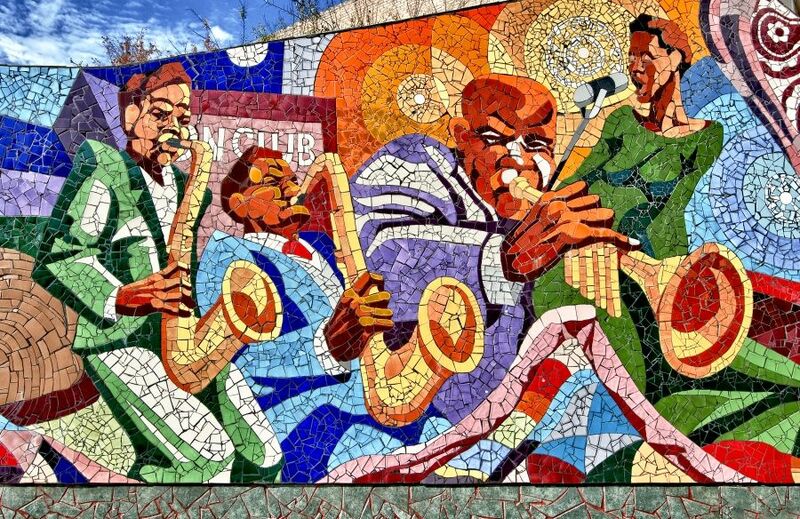 The gorgeous and colorful mosaic tiles of East Austin’s Rhapsody mural combine to create an animated tribute to East Austin’s musical past. The 50-foot-long artwork was designed in 2003 by University of Texas Art Professor John Yancey to commemorate a time when blues and jazz music filtered through the east side of segregated Austin. Yancey, a longtime local resident, searched through old photos and documents to help inform his design, though he has seen much of the change in East Austin firsthand. The work was part of a larger project called “Eleven East,” funded by the Austin Revitilization Authority to memorialize African American institutions along East 11th Street. The plaza where it sits, Charles E. Urdy Plaza, is named for a respected community leader. The work at the corner of 12th and Chicon streets is the reincarnation of a previous piece that was painted over last year. The community pushed back over the original mural’s removal, seeing it as an erasure of the culture and the people that existed in East Austin long before white-owned businesses moved in. Six Square, an organization dedicated to preserving and re-animating that culture, worked with the wall’s current owner to coordinate the repainting. In the interim, they met with community members and sought feedback on the place of public art in the community. Both pieces — the original and the replacement — were painted by artist Chris Rogers. Join us Memorial Day, May 28, for a new mural unveiling. Join us to see the full design of this colorful new mural designed by Color Squad, a Creative Action teen public arts collective. We’ve partnered with GirlForward Austin, a local organization dedicated to supporting refugee girls who have been displaced by conflict and persecution. The mural explores the vision of a truly inclusive community, with the belief that what makes us different makes us stronger. 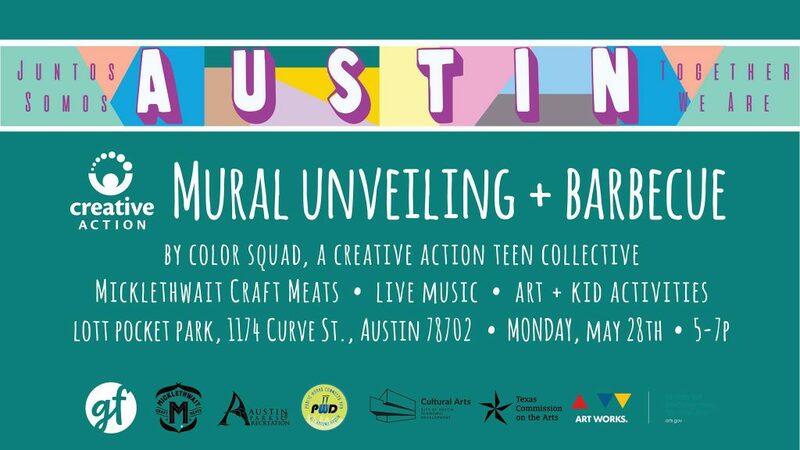 There will be BBQ from Micklethwait Craft Meats, live music, mural tours led by our teen artists, a splash pad, and art activities! How cool is Spring Break Camp?